I had always thought it was very strange that the authorities would persecute such a small group as the Quakers, which could pose very little threat... and the truth is that the authorities didn't originally aim to persecute the Quakers specifically: the Quakers were caught up in laws which were actually aimed at the dissenters among the Church of England clergy. At the point where the movement began, when George Fox went travelling and preaching in England in 1647, England had endured just over a hundred years of religious change and persecution where it became dangerous to be a catholic when Henry seized power in 1534, then dangerous to be a protestant and back again. For someone looking back on those years from the 21st century, it is essential to understand the circumstances of those years running up to the Civil War and later on the restoration of the monarchy, because there were some very basic differences in the Church of England then from now. Since the 14th century in England, when the Lollards had been supressed, churches had been forced to follow a form of service held in the Prayer Book... and sermons were not a normal feature of the service. In fact, a priest who wanted to preach to his congregation required a licence from his bishop. Only about ten per cent of the clergy in England around the beginning of Elizabeth I's reign were licensed to preach. When Elizabeth became queen in 1559, she returned England to protestantism, and attempted to reconcile the different factions in the country. She was faced with Puritans who wished to get rid of saints' days and vestments, remove kneeling during communion, stop the emergency baptism of infants and take out the organs from churches, and who wanted the right to preach. The number of clergy licensed to preach did rise in the course of Elizabeth's reign, but it still meant that you might have to travel to a different parish if you wished to hear someone preach. This lead to the development of two different types of services: one which conformed absolutely to the service laid down in the Book of Common Prayer, and one which cut out parts of the normal service in order to make room for a sermon by the preacher. When James I came to the throne, who had been brought up by Presbytarians, it was hoped that he would be more sympathetic to the views of the Puritans, and they petitioned him to reform the church to get rid of a number of things which they regarded as superstitious hangovers from the Catholic church, such as the practice of making a sign of the cross in baptism, or bowing at the name of Jesus during the services. They also wanted to get rid of the hierarchy in the church. James I called together a conference in 1604 to discuss these proposals, and made some small changes to the book of Common Prayer, but he was of the view that no bishops might lead to no king, and so he did not agree the big changes in structure which were suggested. Some thirteen years later, the Puritans were agitating for changes in the rules for keeping Sunday sacred. It was traditional for people to attend church in the morning, and then to play sports and games on Sunday afternoons. The Puritans argued that playing games was against the commandment to keep the sabbath, and that the whole day should be given over to worshipping God. The King responded to the complaints by issuing a Book of Sports, which outlined which sports were permissible on a Sunday and which were not. It seems that bear-baiting, bull-baiting, interludes and bowling were not acceptable, but archery, leaping, vaulting, dancing, and other such harmless recreation, were permitted. King James seemed to wish to bring the different groups together, to reconcile Catholic and Protestant, and provide a middle way between the two in the Church of England. The outbreak of the thirty years war put paid to that idea, as it was a war between protestant and catholic, which involved James's daughter, Elizabeth. It is perhaps natural that both James and his son, Charles I when he came to the throne in 1625, should have believed in the Divine right of Kings, as having been placed in their positions by God, and should also favour those ways of organising the religion of the country which would lead to stability and respect for the authority of the King. James had tolerated the clergy who omitted parts of the book of common prayer, but Charles I argued for a strict compliance. Meanwhile, the rise of Puritanism in the country lead to people questioning things which had been taken for granted in previous centuries, and which served to contrast the attitude of Puritans to that of the state. Puritans regarded quite a lot of things which remained in the Church of England as idolatrous. They thought that decorating the churches and making them beautiful was wrong, and they disagreed with the Catholic doctrine of transubstantiation, which held that the bread and wine during communion became the body of Christ. Consequently they argued against the installation of altar rails, which separated the space where priests and altar boys could go from the space where the congregation was allowed. Finally, they disliked being called priests, as the word meant someone who offers a sacrifice. They preferred the term Minister, meaning one who serves. When Charles married a Catholic princess from France, there were fears that he intended to return the country to Catholicism. He dissolved parliament when they passed an act of censure on him, and determined to rule without them... and did, for eleven years. In that time, many Puritans left England for America, founding Plymouth colony in about 1620. Although they had separated themslves with the Atlantic from England, they did not separate from the Church of England, and in fact persecuted people who wished to be separate or follow different rules from the established church in England. Far from offering people the religious freedom that they were seeking themselves, they banished, persecuted and executed people who didn't conform. Charles I tried to continue his father's work in reconciling the Churches of England and Scotland, and as a result, marched on Scotland in the First bishops' war of 1639. The Puritans in England were dismayed that Charles was marching to war to retain bishops in Scotland, when they wished to get rid of them in England. The next three years were full of controversy surrounding the right ordering of the church and state, with a parliament which was dominated by Puritans. Eventually the King retreated to Oxford with everyone who was loyal to him, and fighting began between those people loyal to the King and those who supported parliament. During the King's absence, the long parliament appointed a group of divines to draw up a new church liturgy to replace the book of common prayer. The group included people who supported the use of a hierarchy including bishops, presbyterians who wanted elders to rule, independents who wanted each church to be autonomous, and Erastians who thought the state should choose the manner of government of the church. This conference lead to a lot of very basic discussion about how the church should relate to the state, how it should be organised, and how much uniformity there should be between churches in the liturgy. The discussion was not very balanced however, because many of the Episcopalian members, supporting the bishops, failed to attend sessions in late afternoon and early evening, leaving the floor clear for the opponents. Lord Falkland observed at the time "those that hated bishops hated them worse than the devil and those that loved them loved them not so well as their dinner." There were arguments between different factions in the Church of England, and representatives from the Church of Scotland, worried that the decisions of the conference would be imposed on them too. Eventually a directory for public worship was produced in 1645, which was unlike the book of common prayer because it left a lot of decisions to the minister and was based upon preaching and prayers which could be decided by him too. Charles surrendered to parliament in 1647 following the failure of the treaty which was negotiated in Uxbridge. He was eventually charged with high treason and executed in 1649. A book which purported to have been written by him, which showed him in a favourable light came out shortly afterwards, and John Milton published a rebuttal of his flattering portrait of himself and unflattering portrait of the parliamentarians. Between 1649 and the restoration of the monarchy in 1660, there was a great diversity in English religious affairs. The rules which obtained during this period depended upon the area you were in and what the attitude was to the established church there. When the King was restored in 1660, the Church of England was restored too, and the hierarchy of the church of England tried to return to the way things were before the execution of the King. The laws went back to their pre-Civil war state, with Puritans and any who refused to conform to these rules being labelled a "Dissenter". The Clarendon code was a collection of acts designed to support the Church of England. The corporation act (1661) confined municipal and military office to Anglicans who had received communion in church within the previous year. It prevented nonconformists from receiving degrees from Oxford and Cambridge too. The act of Uniformity (1662) compelled the clergy to use the Book of Common Prayer of Elizabeth I with some changes, and more than a fifth of the clergy refused to comply and were therefore ejected from their livings. To cope with the quantity of objectors, the Conventicle act was designed to prevent ejected clergy from preaching,and made it illegal for more than five people not from the same household, to gather together for worship. The Five Mile Act forbad people from coming within five miles of any city, town corporate or borough or any place where they had held a living or had preached previously. It was aimed at nonconformist ministers and wasn't repealed until 1812. About a fifth of the clergy were ejected from their living because they were unable or unwilling to comply with the requirement to use the Book of Common Prayer without alteration, and they set up dissenting and non-conformist churches and meetings around the country. As a result of the Clarendon code, they could be prosecuted for many things, including holding an unlawful Conventicle, preaching without a licence or in the wrong places, and Quakers could also be held for refusing to pay tithes, refusing to swear an oath that they would tell the truth in Court, for travelling on a Sunday by horse...quite apart from the things that they did which seemed to threaten the structure of society, like refusng to take off their hats, or to address someone who considered themselves their better, in a respectful way. Banishing people from the chance to be educated at Oxford and Cambridge, refusing to allow them to take up positions of municipal responsibility or military commission... made people question the whole system in a very fundamental way. They began to question to monopoly on education which was in the control of the rich, and the link with the professions. Nicholas Culpeper, the famous herbalist, saw the three main professions of priest, physician and lawyer were barred to ordinary people by the fact that the literature for those professions was all in latin. He was determined to translate into English one of the main texts for medicine. During the civil war, when the Society of Physicians was unable to enforce their ban on the publishing of translated medical texts, Culpeper published his translations for use by the general public. The insistence on Latin meant that people needed priests to explain the bible, doctors to explain medicine and lawyers to explain the law. There was a general movement to reject these restrictions in all areas. Quakers were not the main target of the laws restricting religious meetings... but they certainly suffered from them, and life for the Quakers of Uxbridge between the setting up of their meeting in 1658 and the eventual passing of the Act of Toleration, which brought to an end the persecution they had suffered, was uncomfortable at least and impossible at worst. The founding of the Quaker Meeting in Uxbridge came at a critical time in history. There had been over a hundred years of change in religious toleration, from times when it was dangerous to be a catholic to times when it was dangerous to be a protestant and back again. Uxbridge had been protestant since the time of Edward VI, and three martyrs were burned at the stake on Lynch green in 1555 in the reign of the catholic "Bloody" Mary, as a warning to the town. There had been the civil war, which seemed essentially to be a fight over money and religion, with the Puritan Roundheads on one side and the Royalist Anglicans on the other. Half the people who lived in an urban environment lived in London, and Uxbridge was just 15 miles from Tyburn as the coaches rattled. The town was the first posting stop on the road out to Oxford, where the Royalist contingent had been based during the Civil war, and Uxbridge had been a Parliamentarian headquarters itself. Many people believed that they were living in the end times of the bible, and that the end was literally nigh. They were seeking the truth, because they believed they might soon be called before God to account for themselves. It is hard to obtain good information about the time when Meetings started in Uxbridge or Woxbrugge as it was sometimes still called then, because it was dangerous to meet if you weren't an Anglican. By 1657 there were already a thousand Quakers in prison in England. It is believed that Edward Burrough, one of the Valiant Sixty first members of the Quaker movement, was responsible for the first meetings here. Certainly by the time George Fox berated the people of Uxbridge in a letter sent in 1659, there had been a Meeting established for some time. Charles II had signed a promise of religious toleration before returning to the throne in 1660, but had instead introduced the Clarendon Code, a collection of acts which made it dangerous and difficult to be a Quaker - or come to that a Catholic, Lutheran, Anabaptist, Ranter or a Jew - in England. These acts banned people outside the Anglican communion from military or public office, and made the Book of Common Prayer compulsory in English churches. A fifth of the clergy refused to comply with the latter, and were therefore turned out of their livings. By 1662 there was a considerable number of non-conformist groups meeting in and around Uxbridge, and three of these were Quaker meetings. The Conventicle Act and Five Mile Act, sought to prevent people outside the Church of England from holding religious meetings or coming to preach in towns. As Quakers were then often challenging the established way of doing things, refusing to pay tithes, travelling on Sundays, or "First Day" to get to meeting, they were constantly in conflict with the authorities and frequently thrown into prison, with their property confiscated. Being the first posting place on the road to and from London meant that Uxbridge received a lot of visitors who were on their way to somewhere else. Many Quakers visited the town and attended meetings here, including George Fox and William Penn. Edward Burrough and Francis Howgill travelled the country holding meetings. They were instrumental in setting up the Bull and Mouth meeting in Aldersgate, which was sometimes attended by very large crowds. (Lord’s day). My wife not being well to go to church I walked with my boy through the City, putting in at several churches, among others at Bishopsgate, and there saw the picture usually put before the King’s book, put up in the church, but very ill painted, though it were a pretty piece to set up in a church. I intended to have seen the Quakers, who, they say, do meet every Lord’s day at the Mouth —[Tavern. D.W.]— at Bishopsgate; but I could see none stirring, nor was it fit to aske for the place, so I walked over Moorefields, and thence to Clerkenwell church, and there, as I wished, sat next pew to the fair Butler, who indeed is a most perfect beauty still; and one I do very much admire myself for my choice of her for a beauty, she having the best lower part of her face that ever I saw all days of my life. "He has made an understandable error and gone to The Mouth just outside the Bishopgate entrance into the City rather than to The Bull and Mouth near the Aldersgate entrance into the City. As he then walked via Moorfields to Clerkenwell, he must have got quite close to his original intended destination. I don’t believe that taverns were open on a Sunday, so perhaps he loitered on a street corner near The Mouth in the hope of seeing Quakers going inside it." Edward Burrough seems to have set up the meeting in Uxbridge by 1658, because it was in that year that John Sands wroteto George Fox to tell him that as Edward Burrough was no longer in the town, the meeting hath been neglected. Burrough was later to die in Newgate Prison, aged 29. The George Inn features strongly in the first century of the Quakers in Uxbridge. It was there that people met in the dangerous days when holding a meeting for worship might make you liable for heavy fines or to go to prison. It was owned by Quakers, which seems incongruous now, when so the Quakers are associated with abstinence or moderation in alcohol. The first Quaker marriage took place at the George Inn, between between Thomas Wright and Mary Redding, in 1677. The innkeeper Richard Richardson didn't confess until another 20 years that he had actually married in front of a priest, because his wife's family were afraid that a Quaker marriage might not be legal. Uxbridge had a huge number of pubs in the 17th and 18th centuries, and was associated with milling and brewing. "The George Inn still remains, though it has been greatly diminished, A portion has been taken off either end in the man street, and converted into two good dwelling houses with shops; the one in the eastern end is now occupied by Mr Handy and that on the western by Mr Basset. The whole is still under one roof. The interior has been much altered. The panelled wainscotting and some old carving formerly to be seen in several rooms, is removed. This estate if the property of Samuel Salter, Esq of Rickmansworth, Herts. The house was considerably larger than now appears. There still remains, notwithstanding all the alterations that have been made, one spacious room which was formerly used for many years as a dissenting place of worship, and the county court is still held in it. Though the inn appears now but as a second-rate house, yet, a very slight inspection of the premises would show that they were able to afford ample accommodation to the Parliamentary commissioners. Here is at the present day stabling for upwards of sixty horses. Many of the rooms are turned into corn lofts, and the whole apearance is materially changed from what it must have been at the time of the treaty. "It appear therefore, that at the Treaty House the parties met. 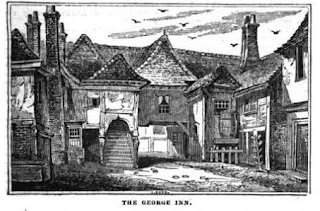 The present George Inn was the place where the Parliamentary Commissioners sojourned; the abode of the King's Commissioners exists no longer as an Inn. "We have extracted these particulars from a very respectable history of Uxbridge, published there a few years since. To the same source are we indebted for the original of the first engraving. The second is from a sketch by a zealous correspondent at Windsor. We visited Uxbridge a few weeks since, and found all accommodations of the George Inn to the letter. There is, however, a sad lack of carved and panelled work in the premises. The large room before spoken of as the rendezvous of the County Court is also appropriated to still more social assemblages. There scores of jovial souls meet ever and anon (for Uxbridge, like every other country-town, has its choice spirits) to quaff away their cares, and blow adrift life's troubles in a cloud of smoke. "We ungratefully forget whether Uxbridge is famed for ale; we know it is for malt, but then the River Colne and the Grand Junction Canal are hard by. The obliging person who showed us the large room said something too about Harmonic Meetings: it is to be hoped the Parliamentary Commissioners were as harmonious there as are the occasional occupants in our times." By the time that the London and Middlesex Archaeological Society visited Uxbridge in 1861, the George was still standing but ad been much altered. George Eves wrote in his paper for the Society that: "Uxbridge has always been noted for the number of its inns: Camden says in his time this town was "full of inns". There are still twenty-one left...." He continued: "The George Inn still remains but much altered. The outside staircase in the yard was removed about three years back: I have a print of it lent me by Mr Hutson, shewing the yard, stairs and entrance from the street; it is taken from a sketch made by Sir W. Ross, the artist, who was a native of this town; his father lived in a house that adjoined the church...."
"ye officers and ye neighbours perceiving the bent of ye Justices mind, rather than let those favourable neighbours go to prison, paid ye money for them..."
Their occupations reflect the main business interests of Uxbridge at the time, which were flour milling, farming and brewing. THIS INDENTURE made the 15th da of December in the fourth year of the reign of our sovereign Lord and Lady William and Mary by the grace of God King and Queene of England Scotland France and Ireland Defender of the Faith. John Hudson's bill for building the first meeting house is £159 10 shillings and tuppence. Thomas Ellwood, who edited George Fox's journal and was the paid reader for Milton, did the accounts. I don't know if he was the writer of the account showing the people who subscribed to the Meeting House, but if he was, he had beautiful, flowing handwriting. The list itself isn't of much interest, but I reproduce it here, in case there are any family historians looking for information about their ancient Quaker relatives. Also, in the course of the research for this website, some of these names have become familiar. There was a surplus from the raising of the subscriptions to the building, which went to the poor and needy. 23 August, 35 Charles II.—Certificate, under the hand and seal of William Bridgeman esq. and J.P. for Middlesex, of the conviction before the said J.P. of Richard Haile of Uxbridge co. Midd. collermaker, of having preached to and taught the persons assembled at an unlawful conventicle, held under colour of exercising religion &c at the George Inn in Uxbridge aforesaid on the 19th inst. Aug.: Certifying also that a fine of 20£. was imposed on the said Richard Haile for his said offence. C. C. C, 35 Charles II. 27 August, 35 Charles II.—Certificate of the conviction, before Roger Jenyns of Hayes co. Midd. esq. and J.P. for Middlesex, of Richard Hale of the George Inn in Woxbridge co. Midd. of having permitted an unlawful conventicle, comprising some twenty persons over and above the members of the said Richard Hale's family, to be held under colour of exercising religion &c. in his said inn on the 5th inst. Aug.: Certifying also that the said J.P. imposed a fine of 20£. on the said Richard Hale for the same offence. C. C. C., 35 Charles II. 15 February, 35 Charles II.—Certificate, under the hand and seal of Peter Sabbs esq. and J.P. for Middlesex, of the conviction of Edward Swift of Uxbridge co. Midd. yeoman, of having been present at an unlawful conventicle, held under colour of exercising religion &c. on 7th Jan., 34 Charles II. at the George Inn in Uxbridge, and of having preached to and taught the persons assembled at the same conventicle: Certifying also that the said J.P. imposed a fine of 20£. upon the said Edward Swift for the said offence. C. C. C, 34 and 35 Charles II. 15 February, 35 Charles II.—Six several certificates, under the hand and seal of Peter Sabbs esq. and J.P. for Middlesex, of the conviction of James Stiles co. Bucks, yeoman, Richard Haeles of Uxbridge co. Midd. yeoman, John Haeles of Stanes co. Midd. yeoman, George Garwell of Heston co. Midd. yeoman, William Garwell of Heston co. Midd. yeoman, and James Polter of Harmonsworth co. Midd. . . . ., of having been present at an unlawful conventicle, held under colour of exercising religion &c. in a certain house at Longford co. Midd., on nth Feb. 35 Charles II. : Certifying also that the said' J.P. imposed a fine on each offender for his said offence. C. C. C, 34 and 35 Charles II. 15 February, 35 Charles II.—Certificate, under the hand and seal of Peter Sabbs esq. and J.P. for Middlesex, of the conviction before the said J.P. of Richard Haels (sic) of Uxbridge co. Midd. yeoman, of having been present at an unlawful conventicle, held under colour of exercising religion &c. in a certain house at Uxbridge on 28th Jan., 1682: Certifying also that the said J.P. imposed a fine of 10£. on the said Richard Haels for the said offence. C. C. C, 34 and 35 Charles II. 15 February, 35 Charles II.—Ten several certificates, under the hand and seal of Peter Sabbs esq. and J.P. for Middlesex, certifying the conviction of each of the following persons, to wit, . . . . Tayler of Uxbridge co. Midd. widow, John Hales (sic) of Stanes co. Midd. yeoman, James Chapman of Thistleworth co. Midd. yeoman, . . . . Addams of Thistleworth co. Midd. yeoman, Thomas Sherrod of Thistleworth co. Midd. yeoman and his wife, William Cottrell of Twitenham co. Midd. yeoman and his wife, Leonard Pitcher of Twitenham co. Midd. yeoman and his wife, Thomas Pocock of Thistleworth co. Midd. yeoman and his wife, Thomas Fuller of Thistleworth co. Midd. yeoman and his wife, and William Garwell of Heston co. Midd. yeoman, of having been present at an unlawful conventicle, held under colour of exercising religion &c. in a certain house at Longford co. Midd. on 14th Jan., 34 Charles II. : Certifying also the imposition of ten several fines of 10£. for the said offences, to wit, a fine of 10£. on each married couple, and a fine of 10£. upon each of the other offenders. C. C. C, 34 and 35 Charles II. 15 February, 35 Charles II.—Six several certificates, under the hand and seal of Peter Sabbs esq. and J.P. for Middlesex, of the conviction of Francis Goodall of Draton (sic) co. Midd. and his wife, Richard Heales (sic) of Uxbridge co. Midd. yeoman, Edward Swift of Uxbridge co. Midd. yeoman, . . . . Tayler of Uxbridge co. Midd. widow, William Franklyn of Harmonsworth co. Midd. yeoman, and James Polter of Harmonsworth co. Midd. yeoman and his wife, of having been present at an unlawful conventicle, held under colour of exercising religion &c. in a certain house at Uxbridge aforesaid on 21st Jan., 34 Charles II. : Certifying also the imposition of six several fines for the said offences, to wit, a fine of 10£. on each married couple, and a fine of 10£. on each of the other offenders. C. C. C, 34 and 35 Charles II. 15 February, 35 Charles II.—Four several certificates, under the hand and seal of Peter Sabbs esq. and J.P. for Middlesex, certifying the conviction before the said J.P. of Edward Swift of Uxbridge co. Midd. yeoman, . . . . Tayler of Uxbridge co. Midd. widow, Francis Goodall of Dreaton co. Midd. yeoman and his wife, James Polter of Harmansworth co. Midd. yeoman and his wife, of having been present at an unlawful conventicle, held under colour of exercising religion &c. in a certain house in Uxbridge on the 14th Feb., 35 Charles II. : Certifying also the imposition of four several fines of 10£. for the said offences, to wit, a fine of 10£. for the joint offence of each married couple, and a fine of 10£. on each of the other offenders. C. C. C., 34 and 35 Charles II. 15 February, 35 Charles II.—Certificate, under the hand and seal of Peter Sabbs esq. and J.P, for Middlesex, of the conviction of Richard Haels of Uxbridge co. Midd. yeoman, of having been present at an unlawful conventicle, held under colour of exercising religion &c. on 7th Jan., 34 Charles II., at the George Inn at Uxbridge, and of having preached to and taught the persons assembled at the said conventicle: Certifying also that the said J.P. imposed a fine of 20£. on the said Richard Haels. In the certificates touching this offender and other conventiclers bearing the same surname, the name is spelt in these five different ways, to wit, Hales, Haeles, Haels, Heales and Heals. C. C. C., 34 and 35 Charles II. 15 February, 35 Charles II.—Two several certificates, under the hand and seal of Peter Sabbs esq. and J.P. for Middlesex, certifying the convictions before the said J.P. of . . . . Tayler of Uxbridge co. Midd. widow, and Francis Goodall of Dreaton (sic) co. Midd. yeoman and his wife . . . . Goodall, of having been present at an unlawful conventicle, held under colour of exercising religion &c. in a certain house at Uxbridge on 7th Jan., 34 Charles II. : Certifying also the imposition of two several fines for the said offences, to wit, a fine of 10£. on the widow Tayler, and a fine of 10£. on Francis Goodall and his wife. C. C. C, 34 and 35 Charles II. 15 February, 35 Charles II.—Three several certificates, under the hand and seal of Peter Sabbs esq. and J.P. for Middlesex, certifying the conviction of (1) William Polter of Harmansworth co. Midd. yeoman and his wife . . . . Polter, (2) Edward Swift of Uxbridge yeoman and (3) William Hales of Uxbridge yeoman, of having been present at an unlawful conventicle, held under colour of exercising religion &c. at a certain house in Longford on 14 Jan., 34 Charles II. : Certifying also the imposition of fines for their said offence, to wit, a fine of 10£. on William Polter and his wife, a fine of 10£. on Edward Swift and a fine of 10£. on William Hales. C. C. C, 34 and 35 Charles II. 15 February, 35 Charles II.—Two several certificates, under the hand and seal of Peter Sabbs esq. and J.P. for Middlesex, of the conviction of Richard Gyden of Harmondsworth co. Midd. . . . . of having been present at two several conventicles, held under colour of exercising religion &c. in a certain house at Uxbridge on two several occasions, to wit, in the morning and afternoon of 21 Jan., 34 Charles II. : Certifying also that the said J.P. had imposed two several fines on the said Richard Gyden for the said two offences, to wit, a fine of 10£. for each offence. C. C. C, 34 and 35 Charles II. . . . . February and March, 35 Charles II.—Six several certificates, under the hand and seal of Peter Sabbs esq. and J.P. for Middlesex, of the conviction before the said J.P. of . . . . Richardson of Uxbridge co. Midd. inholder, of having wittingly and willingly permitted six several unlawful conventicles to be held under colour of exercising religion &c. in a certain Inn in the said parish, commonly called "The George Inn" and in the occupation of the said . . . . Richardson, on four several days, to wit, on the 7th and 21st of January, 34 Charles II. and the 4th and 18th Feb., 35 Charles II. : Certifying also that the said magistrate imposed six several fines on the said . . . . Richardson for the said six offences, to wit, a fine of 20£. for each offence. C.C.C., 34 and 35 Charles II. 5 March, 35 Charles II.—Certificate, under the hand and seal of Peter Sabbs esq. and J.P. for Middlesex, of the conviction before the said J.P. of Richard Haeles (sic) of Uxbridge co. Midd. yeoman of having been present at an unlawful conventicle, held under colour of exercising religion &c. in a certain house at Uxbridge aforesaid on 18th Feb., 34 Charles II. ; Certifying also that the said J.P. imposed a fine of 10£. on the said Richard Hales (sic) for the said offence. C. C. C, 34 and 35 Charles II. The Meeting House built in 1692 was in a dangerous state by the 1750s, and so another subcription was sold to raise funds for a new meeting house. Rebecca Mildred and Son, Thomas Hull Senior, Thomas Goring, Thomas Hull Junior, William Sibley, Joseph Fryer, George Sweatman, Elizabeth Cook, William Ashby, Samuel Reynolds, John Hull, a private present, William Sibley Junior, John Ashby, William Sergood (? ), JAmes Rider, William Osmond, John Finch, Joseph Noakes, Jeremiah Neave, Mary Roake, Thomas Finch, Thomas Finch Junior, Barton Gates, Widow Gurnell of Ealing, John Hudson of London, George Bigg, Widow Jagger of Colnbrook, legacy left in John Hudson's will of £50, Quarterly meeting of London, Monthly meeting of Tottenham. It was built by William Gregory for £238-3 shillings, including repairing of the fences. John Hudson, the builder of the 1692 Meeting House, left £50 to the meeting, which was put towards the building of the new Meeting House. Thomas Crouch was paid seven guineas to rebuild the wall for the meeting house burial ground. The Quakers seem to have been very successful at raising money by subscription for the building of their Meeting Houses in 1692, 1755 and 1818, and usually raised enough money to be able to donate some to the poor in addition to the money raised to pay for the building. The town, when it tried to raise £3000 for the building of the Market House in the 1780s wasn't quite so successful, and so turned to Thomas Hull for £2000 of the money, which he lent them, and allowed them to pay back from the income from the tolls. "Rumours have been circulated of late with uncommon industry, insinuating that the Quakers are monopolizers of corn, and that therefore the high price of corn is owing to the Quakers: a very short, though bold assertion, and a natural conclusion drawn from it; but if the premises should happen to prove false, the conclusion must fall with them." 1st. That the Quakers are monopolizers of Corn; and that monied men among them unite together, for the purpose of speculating therein. 2nd. That they have meetings for this purpose. 3rd. That a meeting-house at Horsleydown, now disused and sold, was filled to the ceiling with corn. 4th That the Quakers in the mealing trade, who attend at Mark-Lane, particularly those of Uxbridge, are monopolizers, and hold great quantities of corn. 5th. That the Quakers who attend at Mark-Lane are very numerous and that they rule the market. He then goes on to address the charges, but first he introduces his remarks with some general information about the corn trade. Apparently the harvest in the year 1799 was very bad, and the secretary to the board of agriculture had published a pamphlet entitled "The Quaestion of Scarcity Plainly stated". Howard states that several people have been convicted of unfair dealing in corn, but no Quaker, although rumours abound that one of the Quakers associated with Mark-Lane had been convicted. The Morning Advertiser had, under the guise of disbelieving the rumours, promulgated them so that they were known by far more people, and as the paper is the one which goes to most of the public houses in London, it is very widely circulated. Howard then deals with the rumours one by one. He can find no evidence that Quakers have been monopolizing the market, or that Quakers have dealt in corn to make a profit, unless their main business has always been dealing in corn. He says that no meetings can be held for a practice that doesn't exist, but in any case, it would not be something that Quakers would do at their meetings, as anyone who reads the pamphlets from the Society about the conduct of meetings would understand. 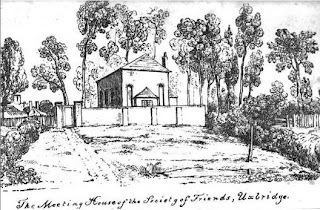 The purchaser of Horsleydown meeting house, which was believed to be full to the brim with corn, set open the doors for several days to prove to passers by that it was not. That of the quantity of mealing business done at Uxbridge, one house, which is not a Quakers, does as much as all the Quakers put together. That the stock of those other persons who are not Quakers, is sometimes much greater than the stock of all the Quakers in that town. That the stock of the Quakers is such, only, as is indispensably necessary for the supply of their customers, in the usual course of their trade. That this accumulation of stock is so far from being a cause of the present high price of bread, and so an injury to the public, that the public are most esentially benefitted by it; for the known fact is and it can be proved, that the enterpsiring spirit of that other house, viewing the probably scarcity of bread-corn in this country, has this very season actually filled its granaries, not from the barns of their surrounding neighbours, but from the stores of foreign states. It is well known that the gentlemen alluded to, have in their own private account improted into this country considerable quantities of corn from Dantzick, and other foreign parts, which had a regular expenditure in the course of their trade. A candid and discerning public will judge then, whether replenishing our granaries with wheat, by those means, meakes men objects of adversion or admiration, or whether they deserve out praise or our blame., I will not hesitate to place them among the benefactors of mankind." Howard continues: "...let us see what is really the conduct of the Uxbridge miller and of the Quakers in particular. "We know that Uxbridge lies in a country where much corn is grown and the river there affords excellent means for grinding. IT is said that London requires on an average about 20,000 sacks of flour for one week's consumption: it must then be a great accommodation to the capital to have such markets, and such mills and millers, in its neighbourhood. Such abound in all the country around, and yet we have seen in times of drought, and in times of frost, there has been some alarm from the apprehension of wanting their aid. Whence then rises this disposition to abuse a useful body of men, only because the article they prepare is scarce and dear? I have not heard that any charge, bearing the appearance of unfair trading much les of monopoly has been made out against any miller at Uxbridge. As to the Quakers, I have inquired minutely and am well assured that their trade is carried on as fairly as any trade is in London. They buy corn at their own market and at other markets near hand; besides this, they are obliged to buy at Mark Lane. What they buy is ground and the bulk of the flour is sent to the bakers, and to the factors in London. All this is just as it should be but a notion is inculcated that they amass large stocks of corn and keep it back. On the contrary, the stocks of these very men, the Quakers at Uxbridge, have been less than usual during the year past, and oftentimes less than was necessary to secure work for their mills, and flour for their customers. Now this is a fact of which I am satisfied by inquiry: and any person whatever may be satisfied in the same way. Is any further proof Possible." "I have mentiond that there was a reason why there are so many Quakers employed in these trades, compared with the smallness of their whole number. I conceive it to be that the employment of a miller is an agreeable one to any man disposed to seriousness; rural life affording more opportunity for retirement and recollection than most trades will admit of. I know several Quakers now in the trade, of whom I could speak well, if it were proper. To do so of the deceased is not exceptionable, and to name only two or three, Benjamin Kidd of Godalming, Thomas Finch of Brentford, and Thomas Hull of Uxbridge, were men of exemplary lives, well esteemed of their neighbours, and a credit to the society of Quakers." The rumours died down a bit, and seem to have become a general rumour that Uxbridge Quaker Millers were so powerful that they could influence the price of corn on the markets... although I don't think this was so. One of the things which the founder George Fox had strongly promoted was honesty and trustworthiness in business. He often had to take goods to market for his master, and he refused to bargain: he set a fair price and expected to keep to that. He didn't like the traditional idea of bargaining, because he considered that telling someone your "best price" and then raising or lowering it was lying. Quakers in any case tried hard to live by their Christian principles, which meant trying very hard to deal with everyone equally, being honest and even handed, and meaning what was said. They also worked hard to produce good quality products, and they treated their workers and colleagues well. By these simple means many Quakers accomplished great success in business. The first Bank in Uxbridge had been established by Norton and Mercer in 1791. After being run by John and Nicholas Mercer from 1805, on the first of January 1806 it became Hull Smith and Mercer when Samuel Hull and John Smith joined the bank "who issue notes to a very large amount," says Redford and Riches' History of Uxbridge. In 1816 a Savings Bank was opened. The History says: The benevolent individuals, who, in other excellent instutitions, have so frequently come forward, togetherwth many other gentlemen in the town and neighbourhood, instututed in 1816 a bank for the avings of the industrious and provident. The objects of the Institution were set forth in several papers circulated through the neighbourhood. The smallest deposit received is sixpence. Thre are four hundred and ninety depositors at present on the books. Samuel Hull, along with Charles Clowes Esq, John Drummond Esq and the right honourable Lord Gambier were the trustees for the Savings Bank, and three Hulls were listed as managers in Uxbridge. An interesting note: September 24, 1864 at the Old Bailey, evidence by a witness says: "I produced a canvass bag with 75 l. in notes; the parties round the small table could have seen it; we sat opposite them: there was a 5 l. Uxbridge note, signed Samuel Hull ." The Meeting House built in 1755 became unsafe in 1817, and a new Meeting House was built and the burial ground enlarged at a cost of £1520-3-11. This is the Meeting House which still stands today. The kitchen was enlarged in 1962. A fire destroyed the old panelling in the small meeting room in 1988, but the moveable panelling in the large meeting house survived. Fourth Month 7th We went to Uxbridge, though naturally rather a low time, yet it ended with my real comfort. The Morning Meeting was a very solemn one, a deep feeling of good and the anointing of the Spirit appeared freely poured forth. The evening Meeting was satisfactory; and in several religious opportunities in the families my heart was enlarged in much love to the dear Friends there; whom I think I may say, I love in the Lord. It was known that she stayed with the Hulls in Uxbridge, but the connection wasn't clear until now. Rebecca Hull was wrongly thought to have married a Hull cousin, but actually married John Fowler from Melksham. Her son, John Fowler, married Elizabeth Pease, whose mother was a Gurney cousin of Elizabeth Fry's. That is the closest connection I can find. Elizabeth's Pease cousin also married a Fry, and her uncle married Anna Hull Fell, daughter of another Uxbridge Hull. The Quakers in Uxbridge seem to have spent most of the 19th century in efforts to improve the education of the people living in and around the town. John Hull (b.1755) had begun the effort with his support of the Boys' Day school, and the School for Industry in the town. 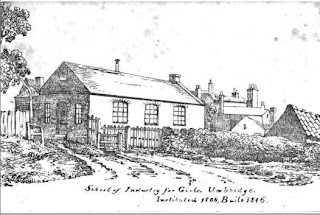 Quakers were to be found on the committees for the School for Industry, the Savings Bank, the Infant school, the Board of Health, the Literary and Scientific Society, the Auxiliary Bible Society and many others. In 1877 an adult school was started among the brickmaking population of West Drayton, on Sunday mornings. In 1880, Alfred Dyer and two other friends, the Bastins, Philp and Jane, took over a cottage in West Drayton and held an evening school there, and a mothers' meeting. Sometimes as many as fifty people crowded into the cottage reported Celia Trott in her book on the history of Uxbridge Quakers, published in 1970. A library started at the Meeting House in 1880, and within four years owned 274 books which were in active circulation. An adult school was established there in 1888. In 1883 a school for poor children was started on Sundays. It started with four teachers and 30 children but soon doubled in size. Alfred Dyer came to Uxbridge meeting in 1880, a publisher who was known for his pamphlets and a journal called "The Sentinel". The work he was best known for was his campaign against sexual slavery. There were three cases which drew public attention to his work, but none was more famous than the case of the kidnapped housemaid. In 1880 Josephine Butler was working for the repeal of acts of parliament which brought prostitutes under the control of the government. In an attempt to stem the increase in venereal disease among the soldiers in the English army, inspections of the men had been instituted but were wildly unpopular. The government decided to take another tack and try to control the spread of disease among prostitutes. The Contagious Diseases act of 1864 and others subsequently, for example, made it compulsory for a woman to submit to medical examination of her most intimate areas if she was accused of prostitution, and if any sign of disease was found, she could be locked up and subjected to compulsory treatment. Many women were falsely accused of prostitution, and one, who worked at a music hall, was famously driven to suicide when she was told she must either submit to examination or lose her job. She refused, the music halls were then told that they would be closed down as operating brothels if they employed her. As Josephine Butler got more involved in protests about this issue, she discovered a traffic in young women to the brothels of europe, not unlike the traffic which is known to exist today from the countries of Eastern Europe to England. It was in this context that she came into contact with Alfred Dyer. Alfred Dyer had been told through an intermediary, of a young English girl being held against her will in a brothel in Brussels. An Englishman had gone to use the services of the brothel and had discovered her there, but despite his sympathy for her, had declined to help because he feared the publicity which might ensue for him. Alfred Dyer investigated the case, with the help of Josephine Butler was able to help the girl escape and to tell her story. 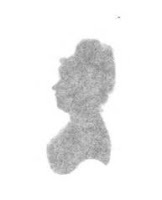 She was a nineteen year old housemaid, Ellen Newland, who had been lured to Brussels from Brighton with the offer of marriage from a Brussels pimp. He had courted her, treated her to suppers and nights out at the theatre, and offered to marryher if she would only move abroad. She travelled with him as far as Calais, where she was kidnapped by his accomplice, take to Brussels, subjected to an examination and sold to a brothel. Alfred Dyer discovered that many English girls were being held against their will by brothels in Brussels, and set up the London Committee for supressing the traffic in British Girls. Initially the police in Brussels denied that English girls were held in Brussels brothels and took investigators on a tour of many which had no underage or English girls in them. However, one of the police officers from Brussels travelled to London and revealed that there was corruption in the police, and that therefore, all the brothel owners visited had been tipped off to keep their underage and English girls out of the way. As a result of this, three members of the Brussels police, and eleven brothelkeepers were prosecuted and convicted in the Brussels court. Alfred Dyer wrote a book, The European Slave traffic in English Girls, which ran to six editions in nine months. In campaigning against this illegal trade in girls, both Alfred Dyer and Josephine Butler risked their reputation, because the public at that time felt that a woman who could be induced to work as a prostitute must be "fallen" anyway. That opinion was changed when there was publicity about the case of Adeline Tanner, a girl who was kidnapped to a Brussels brothel but was found to have a deformity which prevented her from providing sexual services... and therefore she could not be "fallen". The tide of public thinking about these things changed after that case was given publicity, especially since the poor girl had been sent to be operated on without anaesthetic in a Brussels VD clinic before being deported to England. Alfred Dyer campaigned tirelessly against the British Army's use of prostitutes around the world, and against the abuse of women too. He travelled with his wife Helen to many parts of the world, including to the caged women of India, and wrote pamphlet after pamphlet denouncing the attitude of the British government which was so ready to forgive men for their use of prostitutes but so quick to condemn prostitutes themselves. I am a Quaker from Uxbridge meeting.